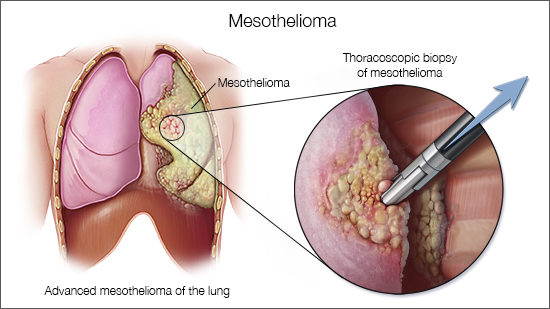 Mesothelioma is cancer affecting the mesothelial cells which cover most internal organs. There are two main types of mesothelioma; pleural and peritoneal. The five-year survival rate for mesothelioma is approximately 6%. Cancer Council. 2018. Mesothelioma. [ONLINE] Available at: https://www.cancer.org.au/about-cancer/types-of-cancer/mesothelioma.html. [Accessed 31 January 2019]. Mesothelioma. Digital image. Mayo Clinic. August 11, 2017, Image URL. “Mesothelioma is an aggressive and deadly form of cancer. Treatments are available, but for many people with mesothelioma, a cure is not possible. Asbestos is the primary risk factor for mesothelioma. Reducing your exposure to asbestos — directly and secondhand — may lower your risk of mesothelioma. “Mesothelioma that can develop decades after exposure to asbestos. Mesothelioma usually targets the outer membrane of the lungs (pleura), but can also occur in the membrane lining of the abdominal cavity (peritoneum). Uncommonly, the heart or reproductive organs may be affected. Australia has one of the highest rates of mesothelioma in the world. This is due to the high rate of asbestos use and mining over many years. In 2007 there were nearly 600 people diagnosed with mesothelioma in Australia. Of these new cases, 81percentt were men. Hazard: A piece of asbestos roofing. Digital image. NEWCASTLE HERALD. July 04, 2018, Image URL. Hazard: A piece of asbestos roofing. Digital image. Cancer Council QLD. Nov 21, 2018, Image URL. “Average life expectancy for mesothelioma patients is 12 – 21 months. How long a patient lives depends on several factors, including age, stage of the disease and overall health. Approximately 40% of patients live past one year, and 9% live longer than five years. Mesothelioma Surgery. Digital image. Mesothelioma Help. 2018, Image URL. “Surgery is the most effective way for mesothelioma patients to extend their life expectancy. There are surgical options for pleural and peritoneal mesothelioma.